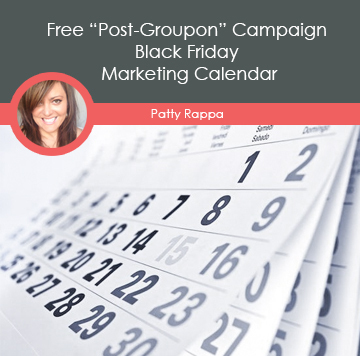 So you ran a Groupon or Living Social campaign and now you’re ready to gear up for some serious holiday marketing. Nice! The key to succeeding this holiday season is to stay visible with customers all throughout November. This leads up to a killer Black Friday and sure to be followed by an awesome holiday spending extravaganza (if done right). This means that even though the economy is slowly coming back, buying power will be up; however, consumers will still be looking for deals. Start by picking three key products/services you want to promote this holiday season. Rinse, repeat for three weeks prior to Black Friday. Then week of Black Friday, it’s all about featuring the products/services you’ve been promoting all month long, at a SUPER AMAZING price. Need more help? Check out my freebie downloadable marketing calendar!